That is what the title should actually be now, but I didn't realize that precessing--but otherwise "stable"--orbits would work in the even dimensions until after I had created the topic (see my 2nd reply for details). I already talked about this idea in the post by Higher_Order, 4D Orbits, but, after looking around on here and elsewhere to see if anyone else had already thought about it, I found nothing, so I thought that this should be its own post. To be clear, I am not absolutely convinced that this is how things definitely work. I do not have a mathematical proof or anything like that, but things do appear to fit together extremely well. Here is the ELI5: the quality of the "oomph" of motion changes with the number of orthogonal rotations allowed by a space, but, when that space is curved toward a point within it, the quality of the resulting "oopmh" of apparent attraction changes with the number of dimensions; and these qualities match to allow stable orbits in odd dimensions only. First, the quality of the "oomph" of apparent attraction created by curved space is referring to gravity and means that how its strength changes with distance depends on the number of dimensions. Specifically, gravity in 3D changes with the square of distance, but gravity in 23D changes with the 22nd power of distance. Generally, gravity in ND changes with the (N-1)th power of distance. This occurs because of spherical symmetry itself. Next, the quality of the "oomph" of motion is referring to kinetic energy and means that how its value changes with velocity depends on the number of orthogonal rotations. Specifically, kinetic energy in 2D and 3D increases with the square of velocity, but kinetic energy in 22D and 23D increases with the 22nd power of velocity. Generally, kinetic energy in (2n)D and (2n+1)D increases with the (2n)th power of velocity (there are no odd powers of velocity). This occurs because of spherical symmetry, too, but in a much less obvious way. First, it is important to understand why exactly kinetic energy scales with the square of velocity in 3D, which is itself not obvious. I recommend reading this PhysicsForums comment on the thread, "The final explanation to why kinetic energy is proportional to velocity squared", where the OP (who also wrote that comment) asks for some sort of deeper, intuitive answer. Maths story short, the "oomph" that is carried away by a fragment after splitting an object into 2 pieces moving in opposite directions logically must work out to depend on the square of velocity of that fragment. In other words, the cost itself of creating motion increases with the motion (i.e. energy per velocity is proportional to velocity, which rearranges to energy being proportional to velocity2). I wrote some more about this in a comment in the post by Higher_Order, but that is the general idea. Then, putting these points together in the context of general rotations leads to the kinetic energies of higher dimensions being qualitatively different from the kinetic energy of 3D. For example, in 4D, there are 2 planes of rotation. An object can spin around its center of mass in 2 orthogonal ways at 2 independent rates, which means that it will have 2 different spin angular momenta. Projecting the object onto either plane of rotation will show the points within it tracing circles; however, it is critical to understand that these points have only 1 actual path through 4D space which is confined to a 2-torus. Another key insight here is that even when the 4D object is "not rotating" in one of the planes of rotation, all of the points in that plane are still "moving" because they are rotating according to the other plane of rotation. This is just like how in 3D every point along the "axis of rotation" still rotates even though they are just points that do not translationally move anywhere. This is how a single object can hold 2 angular momenta at once yet not shred itself into powder. EDIT << I have since realized that rigid objects performing plural rotations do want to do so isoclinically, with identical rates in each plane of rotation, and different rates do create internal stresses that can become great enough to overcome the binding forces of the object material and "shred" it. >> Energy just works in a qualitatively different way from how we are accustomed in 3D. Now, this can be translated from spins into orbits by looking at an orbital system itself as a object that is spinning. When a solid object rotates, it usually does not fly apart because of intermolecular forces. However, when an orbital system rotates, it does not fly apart because space itself is curved, meaning that the orbitting body is still following a "straight" path. This difference in underlying reason also means that the shape of the path does not have to remain circular. In fact, the eccentricity of an orbit can be thought of as a ratio of the components of the orbital velocity that are aligned with the semi-major and -minor axes of the ellipse. When the ratio is near 1, the orbit will be nearly circular; and when the ratio is farther from 1, the orbit is more elliptical. In both cases, the orbitting body is still following its own version of "straight" path. In other words, the orbital velocity skews the curvature, creating eccentricity. Finally, putting these points together in the context of general rotations leads to the orbital systems of higher dimensions being qualitatively different from the simple orbits of 3D. Having only a single plane of rotation oversimplifies things and hides how to generalize angular momentum and how this would actually balance the qualitatively different gravities of higher dimensions when the dimension is odd. For example, assuming that angular momentum remains as it is in 3D for 4D leads to the conclusion that orbital paths still have to stay in a 2D plane where a steeper curvature is no longer compatible because orbital velocity cannot change quickly enough. However, the modified "double-angular" momentum of a doubly rotational orbit overcompensates for this steepness, and orbits are still unstable. But in 5D, curvature changes with the 4th power of distance, which is a steep enough curvature to perfectly match 2 orthogonal angular momenta guiding the orbital path. This results in a 3D region around the center of mass within which the orbital path can wind its way; it would have been a 2D region, but the 2-torus is defined by the elliptical orbits in either plane of rotation. In 6D, "triply-angular" momentum again overcompensates for the increased curvature steepness, but, in 7D, the curvature steepness catches up perfectly again. This results in a 4D region around the center of mass within which the orbital path can wind its windy way; it would have been a 3D region, but the 3-torus is defined by the elliptical orbits in each plane of rotation. In fact, a fascinating way of thinking about this process is that the addition of planes of rotation modify the quality of motion, specifically, they add another time derivative of position into the mix, which can be visualized as vectors, originally pointing at the center of mass, being "peeled away" by the orthogonal motion of the new rotational plane, leaving a new time derivative of position to guide the orbital path; also, the number of decoupled vectors plus one determines the dimension of the region around the center of mass within which the orbital path remains (this becomes an increasingly "thinner" slice of the ambient space since it is scaling with the number of rotational planes). In 1D, there are no such things as orbits, and gravitational sources necessarily induce velocity vectors pointing at the center of mass. In 2D, the ability of a gravitational system to rotate means that it does not necessarily induce a velocity vector pointing at the center of mass, however, the acceleration vector is still stuck, and, in 3D, this becomes a balanced setup. In 4D, the ability to doubly rotate means that the change of velocity induced by one plane is itself changed by the other plane, pushing the acceleration vector off of the center of mass, but leaving the jerk vector, and, in 5D, this becomes a balanced setup. In 6D, the ability to triply rotate means that the change of acceleration induced by the second plane is itself changed by a third plane, pushing the jerk vector off of the center of mass, too, but leaving the snap vector, and, in 7D, this becomes a balanced setup. 8D pushes off the snap vector, leaving the crackle vector, 9D stabilizes it all, 10D pushes off the crackle vector, leaving the pop vector, 11D stabilizes it all, and so on (I think the next vector for 12D and 13D should be called zip). Anyway! The reason I even thought about all of this is a comment by Quickfur in that 4D Orbits thread. quickfur wrote: Since momentum varies with the square of the velocity, when gravity also obeys an inverse square law this allows certain subsets of trajectories to have momentum and force balance each other out in an equillibrium. And then PatrickPowers made me think even more deeply. PatrickPowers wrote: It's because the acceleration vector is always pointing at the center of mass, so the orbit is confined to a 2D plane defined by that acceleration vector and the velocity vector of the planet. So... if this idea catches on and revolutionizes higher dimensional analysis, that is how it started. But, if it turns out to be nothing, it is all their fault. Last edited by d023n on Tue Oct 02, 2018 12:11 am, edited 2 times in total. A different way of interpreting it is that the exponent of acceleration scales with the number of orthogonal planes, although a unit of distance with the same exponent needs to be multiplied in to make up for the fact that acceleration is only distance/time2 and not distance2/time2. I did a little bit more thinking about orbits in the even dimensions, and, while I get why simple 3D angular momentum would lead to instability in 4D because of the increased steepness of the curvature (which is why angular momentum needs to be modified to achieve balance), it was less clear why 2D orbits were not considered stable. After a little googling, I found this Physics Stack Exchange comment which says that "orbits in 2D are stable in the sense the orbiting body does not escape or collapse to the primary" and that "it seems that the orbits are usually not closed, but shaped like flower petals. For near-circular orbits that wouldn't necessarily be too much of an issue." The commenter was not completely sure if this really was the case for 2D orbits, but they linked a reddit post asking about 2D orbits where a comment says that "planetary orbits with gravity dropping off in proportion to 1/r, such as in a 2D universe, would have some precession, where the apogee and perigee of the orbits would constantly change with each revolution." This commenter also links to another comment that has a link to this picture, which shows a precessing, flower-like orbit. This seems to make sense in the context of an orbital path being an attempt at balance between angular momentum and spatial curvature. In 3D, there is a perfect balance no matter how the distance to the center of mass changes. In 4D, without the modified angular momentum, a perfectly circular orbit is stable, but the balance seen in 3D is disrupted by changing the distance to the center of mass, where inward perturbations lead to crashing and outward perturbations lead to escaping. So, in 2D, which still has the same number of orthogonal planes of rotation as 3D (and so uses the same angular momentum) but a shallower curvature, a perfectly circular orbit is stable, but the balance seen in 3D is disrupted by changing the distance to the center of mass, however, the effects are opposite of what happens in the unmodified 4D case. Inward and outward perturbations are overcorrected for by the angular momentum, leading to the flowery behavior. This means that precessional orbits are still possible, not only in 2D, but in all even dimensions as well! While, in 5D, there is a 3D region (defined by a 2-torus made from 2 ellipses) that contains the orbital path, in 4D, there should be a similar 3D region that contains the orbital path; however, it would be defined by a much stranger 2-torus that is created by 2 orthogonal precessing ellipses. Similarly, in 6D, there would be a 4D region that contains the oribtal path, defined by a really weird flowery 3-torus; and so on. This means that, not only is 3 not the only dimension of space in which stable orbits are possible, but orbits are possible in ALL dimensions of space! Something else occurs to me. Not only are stable orbital paths made possible in all odd dimensions by modifying angular momentum according to the number of orthogonal planes of rotation, and not only are precessional but otherwise stable orbital paths also made possible in all even dimensions by the same method, but approximately planar orbital paths are also possible in all dimensions! For example, in 5D, the orbital path is defined by 2 ellipses in either plane of rotation, resulting in a 3D region between a pair of 2-tori, one made from circles whose radii are the semi-minor axes of the 2 ellipses and a larger one made from circles whose radii are the semi-major axes. If, however, one of the 2 ellipses has extremely small axes, the pair of 2-tori that bound the stable orbital region will appear flattened, and the orbital path itself will accordingly better approximate a planar ellipse. Of course, this is not without cost. That extremely small ellipse translates into extremely high orbital speeds in that plane of rotation, which could potentially still shred the orbitting body. In fact, this problem only grows with more orthogonal planes of rotation, meaning that approximating a planar orbital path becomes increasingly difficult in higher dimensions. So, I was wondering about the underlying justification for modifying angular momentum. At the beginning of this thread, I said that quality of the "oomph" of motion changes with the number of orthogonal rotations allowed by a space and that this occurs because of spherical symmetry. I followed that up with a long attempt at explaining what I thought that meant, relating velocity to kinetic energy, transitioning to angular momentum, and so on; however, I think that I narrowly missed a more fundamental approach. That approach is Noether's theorem. Angular momentum is conserved because of rotational symmetry, so changing the quality of rotational symmetry by adding more orthogonal planes of rotation should naturally change the quality of the conserved quantity that exists as a result of that symmetry, namely, angular momentum. The exact maths behind this is a little beyond me though, ha, especially when it starts getting into stuff like gauge theory. That being said, this also has me thinking that linear momentum in higher dimensions should be qualitatively different as well, scaling with velocity raised to the number of orthogonal rotations. In 2D and 3D, it is just mass * velocity, but it would be mass * velocity2 in 4D and 5D, and it would be mass * velocity3 in 6D and 7D, and so on. But why should "linear" momentum have anything to do with rotations? Linear momentum is a conserved quantity due to translational symmetry, so, again, why would it be different in higher dimensions? Good question. This is definitely some weaker speculation on my part, but a translation is technically just a rotation whose center is at infinity, which means that "linear" is just a special case of "rotational" and not the other way around, and this should somehow translate into a fundamental change in the nature of motion every time a new orthogonal plane of rotation is opened up in higher dimensions, even for simple translational, "linear" motion. I was curious how the velocity of a 5D orbitting body would change, so after a little vis-viva here and a little WolframAlpha there, I came up with a visualization and some observations. When a 5D orbital path is projected onto either of its planes of rotation, the result is 2 ellipses whose eccentricities and absolute lengths (and thus, orbital periods) can be quite different. These 5 plots represent 5 different objects, each with a different ratio of its 2 eccentricities. All 5 objects have 1 component ellipse (along the Y axis) whose semi-major axis is 1.5 times the length of its semi-minor axis. The other component ellipses (along the X axis) have a semi-major axis that is, from left to right, 1.1, 1.5, 2, 2.5, and 5 times the length of its semi-minor axis. The Z axis represents orbital velocity. The orbital path can be thought of as a straight line across the contour map, which behaves like a 2-torus, where the angle of the line encodes something about the relative orbital periods in each plane of rotation. However, it is actually rather complicated. In 3D, knowing the period and eccentricity of an orbit allows you to figure out its absolute length and velocities anywhere along the path, and that is all the relevant interesting information there is. In 5D, on the other hand, each of the component ellipses has its own eccentricity and its own period, and the same 2 ellipses can be aligned in different ways. For example, an orbit whose component ellipses have identical eccentricities (second from the left in the image) and identical periods (so a 45 degree line) might have an alignment where the periapsis and apoapsis of each ellipse occur together, representing an orbital path with the greatest change of velocity, or it might have an anti-alignment of each ellipse, representing an orbital path that has 2 fastest points and 2 slowest points per orbit. In the higher dimensions, these complications compound, and solar systems become more and more diverse. In an earlier comment, I said that approximately planar orbital paths are possible in all dimensions, but after some more thinking, I realized that exactly planar orbital paths should be possible in at least the odd dimensions, specifically when the orbit is isoclinic. That is to say, if the orbitting body is moving at the same angular velocity in all planes of rotation, it should follow a Villarceau circle through the orbital region. I think this should still work when the projections of the oribtal path onto the planes of rotation are ellipses, which would make it a "Villarceau ellipse" instead, but I think that the ellipses would need to have identical eccentricities and also be in phase with each other so that all apoapses/periapses occurred together. This should also work in the even dimensions when the projections of the oribtal path onto the planes of rotation are perfectly circular, but I am not exactly sure what effect orbital precessions would have. Either the orbital path stays in a single plane but precesses around in a "Villarceau flower" of some sort, or the plane itself precesses around somehow, or something else entirely happens, ha. Definitely something to look into. I was also wondering some more about how exactly an orbitting body ends up using one set of planes of rotation instead of some other set. In 3D, this task is trivial because there can only be a single plane of rotation, thus, if the position and velocity of an object relative to some other object are known, then the plane of rotation is automatically determined. However, in 5D, position and velocity are insufficient for determining a unique pair of planes of rotation, which is why I have talked about acceleration being shifted away from the center of mass, and jerk remaining directed at the center of mass to guide the acceleration. But still, the ambient space does not have a special pair of planes of rotation dictating how all orbital systems are to split their rotations. An isoclinic rotation does not have a unique set of planes of rotation, and yet it produces a planar orbital path! In a 3D universe with only 1 massive object, if another massive object were to suddenly pop into existence with an appropriate distance and velocity, then the 2 would enter into a planar elliptical orbit. Similarly, in a 5D universe with only 1 massive object, if another massive object were to suddenly pop into existence with an appropriate distance and velocity, then the 2 would initially enter into a planar elliptical orbit, but it would be an orbit that, if another massive object were to pop into existence, would be perturbed into a specific pair of planes of rotation, allowing the orbital path to become more complicated as I have already discussed in earlier comments. In general, orbital paths in odd dimensions want to be Villarceau ellipses with no unique set of planes of rotation, that is, until external influences deflect the relevant time derivatives of position of the orbitting body (1 for each plane of rotation; so velocity in 3D, acceleration in 5D, jerk in 7D, etc.) away from the center of mass. Technically, in 3D, velocity must be directed away from the center of mass to have an orbital path at all, so I should say that paths of motion between 2 objects want to be straight lines, as they always are in 1D, until external influences deflect the relevant time derivatives of position. I am curious to know if anyone has any questions or criticisms or suggestions so far. I still have not found anything similar elsewhere, but I also have not really made any further progress with the topic and was hoping I could pick someone else's brain about it. 3D is not the only dimension with stable orbits; in fact, all dimensions allow stable orbits (aside from 1D, of course). The increasingly "steeper" spatial curvatures (gravities) in higher dimensions are matched by increasingly "looser" angular momenta. Gravity gets "steeper" because additional axes of space upgrade the dimension of the spherical symmetry according to which its influence is spread; however, angular momentum gets "looser" because additional planes of rotation upgrade the dimension of the rotational (toric) symmetry according to which its path can be guided by gravity. Specifically, Noether's theorem requires that the angular momenta of higher dimensions operate differently because of upgraded rotational symmetries. In odd dimensions, the balance between "steepness" and "looseness" results in perfectly stable orbits; but in even dimensions where new planes of rotation occur and where angular momentum is suddenly slightly "looser" than is necessary for the "steepness" of gravity, a balance is still achieved but results in precessively stable orbits. Finally, orbits in all dimensions want to be isoclinic "Villarceau" planar paths but can become increasingly complicated for higher dimensions where increasingly more time-derivatives of position of the orbitting object can become deflected away from the orbital center of mass, leading to toric orbital regions. I have added a couple of edits to the first post in this topic and to my very first post about this idea in the 4D Orbits topic. Apparently, energy and angular momentum do not have the same units. slaps forehead. Duh. Luckily, mr_e_man was awesome enough to notice and point this out to me. Energy and torque have the same units, whereas angular momentum and action have the same units. This was a pretty ridiculous mistake, yep, but the point I had originally been trying to make with it was never very rigorous (or clear) in the first place, and fortunately it doesn't really adversely affect the core idea that something changes to balance how gravity changes in higher dimensions, and that that something is angular momentum because of Noether's theorem and how rotational symmetry gets upgraded in every even dimension. I hope the mistake isn't why I haven't received any responses (aside from mr_e_man in that other thread), but I can understand if it was. Since momentum varies with the square of the velocity, when gravity also obeys an inverse square law this allows certain subsets of trajectories to have momentum and force balance each other out in an equillibrium. Just checking back in to see if anyone has given any thought to these ideas yet. (1) Compensates for the new inverse power law of gravity to create a stable orbit in all odd dimensions. (2) Overcompensates for the new inverse power law of gravity to create a precessionally stable orbit in all even dimensions. "Villarceau circle/ellipse" orbital paths when angular momentum components are balanced/isoclinic. "Torus knot" orbital paths within an n-toroidal region when angular momentum components are unbalanced/anisoclinic. I noticed that the Dimensional Features Summary page says that 3D "is the only dimension where stable orbits (as we know them) are possible"; and that, in 4D, the inverse cube law "causes the only stable orbit to be a perfect circle, and even the slightest disturbances will cause the orbiting object to fall out of its orbit." If, as I have been saying, angular momentum changes according to the planes of rotation and the associated rotational symmetry, then both of those statements would be wrong, and, again, orbits would be stable in all dimensions, albeit a bit slippy in the even ones. I would ask that the page be corrected, but since I am not entirely sure why this whole topic has been ignored for over 3 months now, I am at a loss. wendy? Patrick? quickfur? Klitzing? ICN5D? Anyone?? What am I missing here? Angular momentum is defined as the bivector L = r ^ (mv), where r is the position vector (pointing from the sun to the planet) and mv is the linear momentum vector. I assume the "distance exponent of 2" is from using v = r w, the equation relating linear speed v to angular speed w in circular motion. Then the magnitude of angular momentum is L = r m r w = m r2 w.
In n dimensions, the commonly used theory says that gravitational acceleration is a = G M / rn-1 (in the direction of -r ). You can see the results of it (including instability) here: https://testtubegames.com/gravity.html . How do you suggest modifying these equations? Is the gravitational acceleration simply replaced with a higher derivative of r ? What do you think angular momentum should be? mr_e_man wrote: Angular momentum is defined as the bivector L = r ^ (mv), where r is the position vector (pointing from the sun to the planet) and mv is the linear momentum vector. I assume the "distance exponent of 2" is from using v = r w, the equation relating linear speed v to angular speed w in circular motion. Then the magnitude of angular momentum is L = r m r w = m r2 w.
I think angular momentum should be L = m (r1 v1) (r2 v2) in 4D and 5D; L = m (r1 v1) (r2 v2) (r3 v3) in 6D and 7D; L = m (r1 v1) (r2 v2) (r3 v3) (r4 v4) in 8D and 9D; etc. In general, angular momentum should be Lk = m (r1 v1) ... (rk vk) in (2k)D and (2k+1)D, which, for isoclinic rotations, would simplify to Lk = m rk vk. In terms of angular speed, this would be Lk = m (r12 w1) ... (rk2 wk) in (2k)D and (2k+1)D, which, for isoclinic rotations, would simplify to Lk = m r2k wk. The v's refer to the components of linear speed in the orthogonal planes of rotation, the w's refer to the angular speeds, and the r's refer to the radii of the k-torus layer in which the orbiting object traces a path, meaning that r12 + ... + rk2 = R2, where R is the distance from the orbital center to the orbiting object. If all of the r's are equal, then the k-torus layer is the symmetrical "middle" (Clifford torus) layer, and the orbit will be isoclinic (the v's/w's are equal), and the orbital path will be circular. If, on the other hand, the r's are unequal, then the k-torus layer is asymmetric, and the orbit will be anisoclinic (the v's/w's are unequal), and the orbital path will be a torus knot. While the subscripts of the angular momenta refer to number of planes of rotation, the subscripts of the gravitational constants refer to number of dimensions. Also, while the units of angular momentum gain another (distance2/time) factor for every additional plane of rotation, the units of gravitational acceleration obviously remain as (distance/time2), which forces the units of the gravitational constant to gain another (distance) factor for every additional dimension to cancel the incrementing exponent of distance in the denominator. I also typed up the following about how the different locations on the surface of a ball can have different experiences with respect to speed(s) and center(s) of rotation. Orbits are obviously not rigid objects, but I find the analogy of an orbiting object as a single point in the surface of an orbital system "ball" helpful. In 2D, every single point will experience the same speed and agree on the center of rotation as the true center of the ball. In 3D, every single point with identical latitude will experience the same speed and agree on the center of rotation, but there will be a gradient of speeds and centers of rotation across latitudes. The equatorial points will experience the fastest speed and will have a center of rotation at the true center of the ball, whereas each pole will experience no speed (but still rotate) and will have a center of rotation in the surface; that is to say, it will be its own center of rotation. Points in intermediate latitudes will experience intermediate speeds and will have centers of rotation that are inside of the ball somewhere along the line segment that connects the poles and true center of the ball. In 4D, if the ball is only rotating with a single plane of rotation, there will again be a gradient of speeds and centers of rotation. The circle of points in the plane of rotation that passes through the center of the ball will experience the fastest speed and will have a center of rotation at the true center of the ball, whereas each point in the circle of points in the plane that still includes the center of the ball but is orthogonal to the first one will experience no speed (but still rotate) and will have a center of rotation in the surface; that is to say, each point will be its own center of rotation. This pair of circles can also be thought of as an orthogonal pair of degenerate 2-tori between which spans a range of 2-tori, of which there is a single 2-torus that is perfectly symmetrical (a Clifford torus), being equidistant from each degenerate 2-torus. Points in these intermediate 2-torus layers will experience intermediate speeds and will have centers of rotation that are inside of the ball somewhere in the disk that connects the stationary degenerate 2-torus and true center of the ball. If, on the other hand, the ball is rotating with a pair of planes of rotation, but not isoclinically, points in the faster degenerate 2-torus will experience the fastest speed and will have a center of rotation at the true center of the ball, but each of these points will also be a (moving) center of the slower rotation. Furthermore, points in the slower degenerate 2-torus will experience the slowest speed and will have a center of rotation at the true center of the ball, but each of these points will also be a (moving) center of the faster rotation; however, points in these degenerate 2-tori will be the only ones that are a (moving) center of rotation, as well as the only ones that have a center of rotation at the true center of the ball. As one moves away from either degenerate 2-torus and considers 2-torus layers that are closer to the symmetrical 2-torus layer, points will have a pair of (moving) centers of rotation that are inside of the ball, with each one somewhere in the appropriate (rotating) disk that connects the corresponding (rotating) degenerate 2-torus and true center of the ball. As for the actual paths of these points, rather than tracing circles like in the case of a single rotation, points in any of these non-degenerate 2-torus layers will trace torus knot paths that depend on the relative angular speeds of each plane of rotation. If the ball is rotating isoclinically though, every single point will experience the same speed, and every single point in every single 2-torus layer will trace a circular path (Villarceau circle). In 5D, there are again latitudes, a pair of proper poles, and an equator like in 3D, but every latitude also contains an instance of everything mentioned in 4D, such as the pair of degenerate 2-tori, the span of 2-torus layers, and the symmetrical "middle" layer. Things are slightly more complicated because these plural rotational structures can now be thought of across latitudes, but as far as orbits are concerned, the situation is essentially the same as it is in 4D, except that gravity is now steeper, causing orbital paths to be fully stable and not precess. In 6D and 7D, there are 3 degenerate 3-tori, 3 semi-degenerate 3-tori, a more complicated span of 3-torus layers, but still just a single symmetrical "middle" layer. However, this is now a bit beyond the immediately useful scope of what I already said about angular momentum, so I will finally go ahead and submit what I have. I took waaay too long to respond, and I think that was because I actually spent most of the time second guessing myself. Hopefully I haven't made any ridiculous mistakes again, hah, or left out any points I should have made to more clearly explain things. Last edited by d023n on Wed Dec 05, 2018 7:03 am, edited 1 time in total. It looks like your angular momentum is proportional to an "exterior power" of the standard one, which would be a multivector with grade n-1 or n (that is, a "pseudovector" or "pseudoscalar"). So it is already conserved; you don't need to redefine things. But as I said before, a single particle has non-zero angular momentum in only one plane; most of the components of L are 0. So its exterior powers are all 0. This plane is determined by the particle's initial position and velocity, and there is no reason for the orbit to leave this plane. To support this point, I see that you use the same equation for gravity*, which only uses acceleration, no higher derivatives. An n'th order differential equation's solution is determined by n initial conditions. 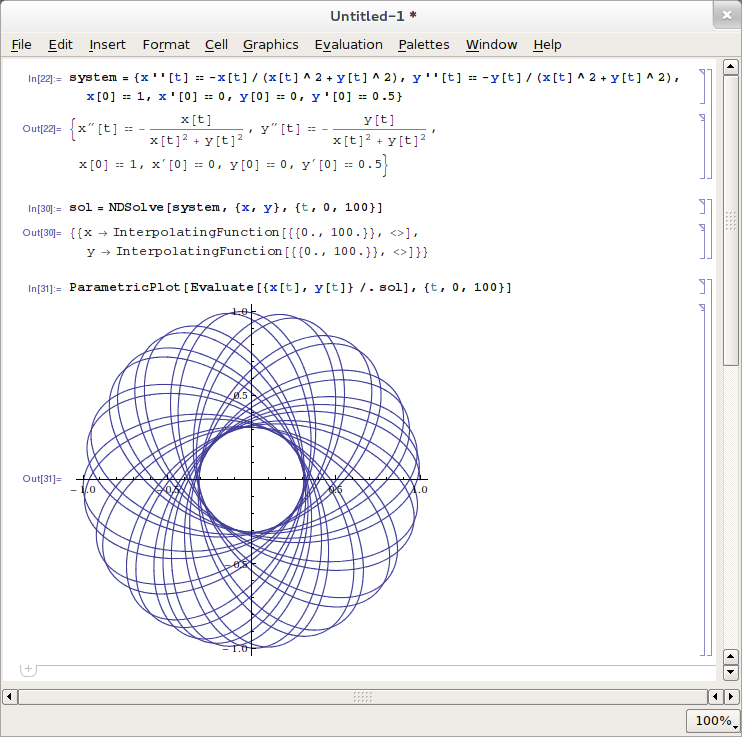 In this case, n=2, so the orbit is completely determined by the initial position and velocity. Rigidity does make a difference. A point in a 4D spinning ball would follow a torus knot path, but it wants to move in a circle (better yet, a straight line). It's pulled into this path by the surrounding particles. In gravitational motion, there are no other particles to pull it out of planar motion. *Is your gravity completely radial? The situation could be different if it had a component perpendicular to the plane. This appears to happen in reality, but it's extremely weak, and it depends on velocity; I'm imagining something depending only on position. This would also make possible orbital motion involving only first-order derivatives. mr_e_man wrote: But as I said before, a single particle has non-zero angular momentum in only one plane; most of the components of L are 0. So its exterior powers are all 0. This plane is determined by the particle's initial position and velocity, and there is no reason for the orbit to leave this plane. *Is your gravity completely radial? So... I made another mistake. But first! Thank you for pointing me toward the exterior algebra! ^_^ Interesting stuff. Interestingly, multiplying the angular momentum and gravitational time-derivative of position results in (Lk) (dkv/dtk), which is also m v2k+1, where k is the number of planes of rotation (e.g. 2 and 4D and 5D, 6 in 12D and 13D, etc). In other words, the changing details of the L's and G's reflect the changing rotational and spherical symmetries of higher dimensions, respectively. mr_e_man wrote: Rigidity does make a difference. A point in a 4D spinning ball would follow a torus knot path, but it wants to move in a circle (better yet, a straight line). It's pulled into this path by the surrounding particles. In gravitational motion, there are no other particles to pull it out of planar motion. I know, and I think it would be the anisoclinicity of the components of the general rotation that function as the source of "rigidity" that maintains the torus knot path within the relevant torus layer for that particular degree of anisoclinicity. Hmm, it's something along the lines of how, if you were to twirl something at the end of a string but then also rotate the direction that you are facing, then the object at the end of the string would be flung away from you, causing the string to become more parallel to the ground, even as it is still be twirled, but now in a sort of cone shape where the cone tip is at your hand. Of course, this analogy isn't perfect since we can't actually double rotate in 3D, but it's close. And then there's still the idea that isoclinic orbits would be planar, which is neat. In a circular orbit (possibly isoclinic), the derivatives of position cycle through right angles. If r is to the right of the origin, then v=r' is up, a=r'' is left, j=r''' is down, s=r'''' is right again, etc. But your laws of motion, in 4D for example, have j parallel to r, which is right or left, not down. Also, in 3D, the product of scalars mrv is not conserved in an elliptic orbit, assuming that r is the distance from the origin to the particle, and v is its speed. It is conserved if r is the distance from the origin to the tangent line of the particle's path, or if v is the speed perpendicular to the position vector. In other words, mrv sin θ is conserved, where θ is the angle between the position and velocity vectors. This is naturally accounted for by the wedge product. How would you describe this for L in higher dimensions? I said this in the context of gravitational acceleration. It may be irrelevant with higher-order derivatives. and so on. It's obvious that the odd-order derivatives are never parallel to r, because (- e1sin αt + e2cos αt) is never parallel to (e1cos αt + e2sin αt). So the type of force law you're considering, with a derivative of r parallel to r, cannot produce a torus knot. I still don't understand why you want to talk about isoclinic orbits, when they're indistinguishable from 2D circular orbits. mr_e_man wrote: In a circular orbit (possibly isoclinic), the derivatives of position cycle through right angles. If r is to the right of the origin, then v=r' is up, a=r'' is left, j=r''' is down, s=r'''' is right again, etc. But your laws of motion, in 4D for example, have j parallel to r, which is right or left, not down. This is only true when there is a single plane of rotation at play though. For example, with a double rotation, the acceleration vector is no longer in the original plane defined by the position and velocity vectors, and the jerk vector takes its place parallel to the position vector. For a triple rotation, the jerk vector is then kicked out of the original plane, and the snap vector takes its place parallel to the position vector, etc. mr_e_man wrote: Also, in 3D, the product of scalars mrv is not conserved in an elliptic orbit, assuming that r is the distance from the origin to the particle, and v is its speed. It is conserved if r is the distance from the origin to the tangent line of the particle's path, or if v is the speed perpendicular to the position vector. In other words, mrv sin θ is conserved, where θ is the angle between the position and velocity vectors. This is naturally accounted for by the wedge product. How would you describe this for L in higher dimensions? It is just an interesting coincidence that I noticed. I want to say that it suggests to me that I am on the right track, but that would still just be wishful thinking at this stage. mr_e_man wrote: So the type of force law you're considering, with a derivative of r parallel to r, cannot produce a torus knot. Like I said, the intermediate derivatives between velocity and the relevant gravitational one do not remain in the plane defined by the position and velocity vectors. This means that an isoclinic orbit and a 2D orbit are very much distinguishable, despite the fact that both are planar. For a 2D orbit, the acceleration vector is parallel to the position vector and guides the velocity vector, and the orbital path is drawn accordingly. However, for a 4D isoclinic orbit, the acceleration vector is outside of the position-velocity plane, the jerk vector is parallel to the position vector and guides the acceleration vector which guides the velocity vector, and the orbital path is drawn accordingly. In other words, the instantaneous position-velocity plane itself is changing during plural rotations. d023n wrote: For example, with a double rotation, the acceleration vector is no longer in the original plane defined by the position and velocity vectors, and the jerk vector takes its place parallel to the position vector. For a triple rotation, the jerk vector is then kicked out of the original plane, and the snap vector takes its place parallel to the position vector, etc. d023n wrote: For a 2D orbit, the acceleration vector is parallel to the position vector and guides the velocity vector, and the orbital path is drawn accordingly. However, for a 4D isoclinic orbit, the acceleration vector is outside of the position-velocity plane, the jerk vector is parallel to the position vector and guides the acceleration vector which guides the velocity vector, and the orbital path is drawn accordingly. I also just showed that the odd-order derivatives, including jerk, are never parallel to the position vector. Do you agree that a general double rotation has this form?